or Company Outing - Contact Us Today! From the Fitz travel to the lock house via the canal, about 2 miles. Portage to the river. Paddle or drift down the river to the first set of high wires about 2.5 miles. Take portage to the canal, and paddle back to the Fitz. Trip time about 2 1/2 hours. From the Fitz travel to the Lock House via the canal, about 2 miles. Portage to the river and paddle or drift down the river approximately 4 miles. Pass under the Pawlings Road bridge and take out on the left and up the bank to the parking lot for pickup. Trip time about 4 hours. From the Fitz travel to the Lock House via the Canal, about 2 miles. 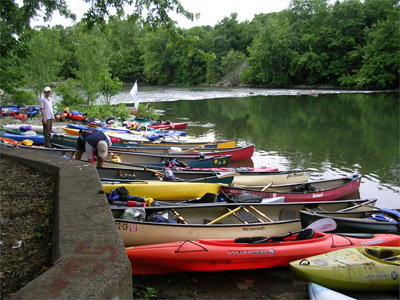 Portage to the river and paddle or drift down the river approximately 6 miles. Take out on the left just before the Betzwood Bridge. Up the boat launch and into the parking lot for pick up. Trip time about 6 hours. Paddle down the river by canoe as the sun sets. Portage to the canal and back to the Fitz where you will enjoy dinner and drinks by candle light on our deck. Toast your sea mates for another wonderful trip on the Schuylkill River and Canal. Make your reservations early. Minimum of 10 people for this trip. Ask for pricing. Take the shuttle bus from the Fitz to the lock tenders house. Put into the river and drift down the 2 to 2 1/2 miles to the take out sign. Walk the trail back to the Fitz. After a long day on the river join your friends at the restaurant and enjoy our extensive menu of beef and seafood entrees, along with a variety of appetizers and tasty sandwiches. For larger groups we will be happy to cater your event on our deck overlooking the Schuylkill Canal.